Our final Shadowrun mission begins! For the first time in my Game Master Shadowrun career, I’m using a pre-written adventure. 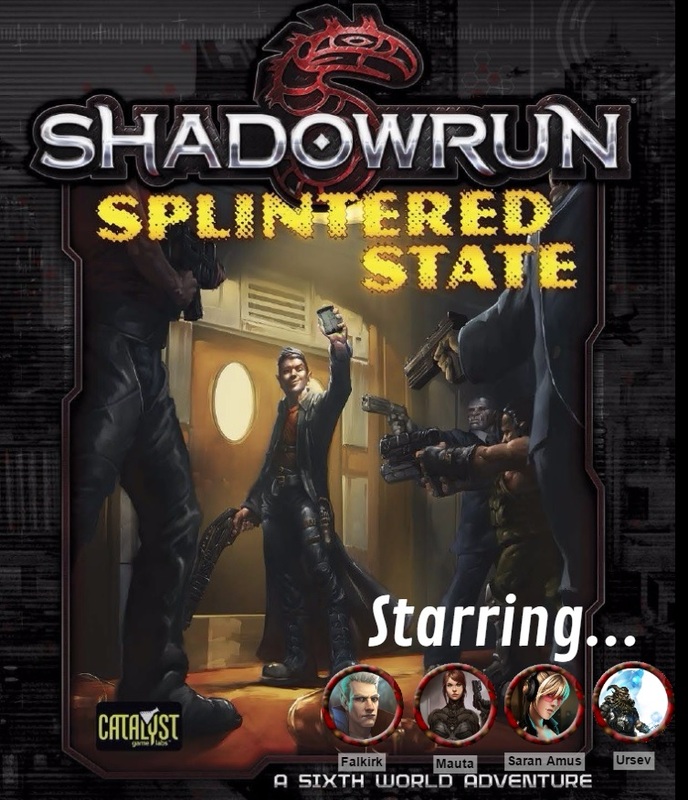 Published by Catalyst Game Studios, the creators of Shadowrun Fifth Edition, “Splintered State” is a story about a mysterious commlink that gets the runners into a lot of trouble. It’s designed as a springboard for new runners, but I’m using it as a finale for our street-level campaign with a bit of tweaking and modifying. We all have busy lives outside of our weekly online get-togethers, and this week was especially busy. One player had just returned from an out of state vacation while another was literally calling in from his iPad from a hotel as he began his vacation. And still another couldn’t make tonight’s session. Thus I was super lenient about allowing for plenty of time to spend Karma and money to advance everyone’s characters. Story-wise this mission picks up 24 hours later after last night’s bloody shenanigans, but I’m giving leeway for everyone to advance their characters at any time during the adventure. An obvious reason is that this mission is our final Shadowrun adventure, and I want my players to be able to spend their hard-earned rewards. To make “Splintered State” work as the finale for my campaign, I did have to insert some heavy modifications in the beginning – mainly changing most of the NPCs and dropping Scene 1 entirely. I was able to fit in the arrest of the runners as the Prologue and inciting incident, which worked perfectly following the events of the last run (and was my main inspiration for using this mission). Beyond that I reintroduced characters from their past, like gang leader Jeremiah Redd and Knight Errant Detective Dana Oaks. I cut out the whole portion with a random quest-giver, and changed the reason the players went to the motel entirely, working in a previous NPC from their first mission. It just didn’t make sense to put the runners through a super simple exercise to ease them in. Instead I upped the stakes and made it personal, leveraging their history with Jeremiah Redd and Jay-T, the latter whom conveniently just woke up from his coma the runners put him in and his hiding out in the Novelty Hills Sleep & Eat motel. Of course in true Shadowrun fashion, nothing is ever quite that easy. From here the mission should sync up much closer to the published adventure, with a few more NPCs changed out. My players mentioned that they really enjoyed seeing all these past NPCs come back in meaningful ways. Toward the end of our shortened first session I threw in yet another blast from their past as they left the motel – the gang full of named NPCs they had fought with at Jay-T’s at the beginning of “Road Rage.” Nothing like ending a campaign by bringing all the major (and minor) players back! Four missions may seem a bit short for a campaign, but each mission has taken us anywhere from 4-7 weeks. By the end of this adventure this campaign will have lasted us about five months (six months total of doing Shadowrun, including our introductory, pre-generated “Food Fight” mission). 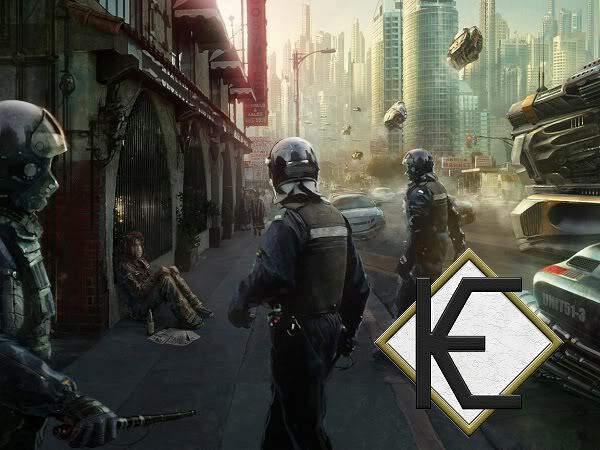 Hopefully it will end up playing off as a fun finale and we leave our cyberpunk adventures on a high note.